This wasn’t a victory over the dark forces of misogyny as much as it was a parody-defying collision of 2015 collegiate caricatures: a feminist organization feeling threatened by a song sung at a party to which they were not invited and would have no interest in attending; a party full of co-eds getting drunk and yelling a stupid, obscene song about sexually violating a prostitute’s corpse. 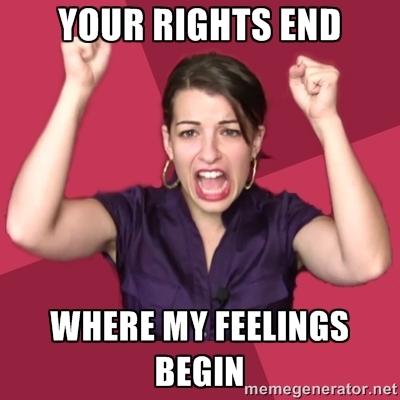 But the feminists in general seem to always take a statist approach to any situation. Their preferred method is the tattle method: find someone with power over those who they find offensive and make those in authority punish the offending parties. If this does not work, often they resort to violence. Instead of acting like adults, removing themselves from a private party or an uncomfortable situation, and going on with their lives, they seek punishment of anyone they find offensive. They often skip the part where they try to have a conversation with the offending parties. This is not adult behavior, and this is not civil behavior. The frustration in the college feminists are evident in the article. McKinsey [President of UMW’s Feminists United on Campus (FUC)] says there were “hundreds” of Yaks, all of them of a similar tone… She felt she’d done her part by meeting with the school’s Title IX coordinator and administrators, and in response, she’d found herself demonized on social media. Technology is undermining feminism. Fascists like McKinsey cannot sensor apps like Yik Yak. Sure, those apps can be shut down by government, but replacements always will spring to life. There is no filtering acceptable thought and there is no college administration to protect McKinsey’s fragile feelings from the digital community. The college feminists are learning they they are not popular. Their childish behavior, their sexism, their blatant intolerance, and their reckless actions against innocent individuals is widely disdained. This is not the first time feminism has failed in the digital realm. 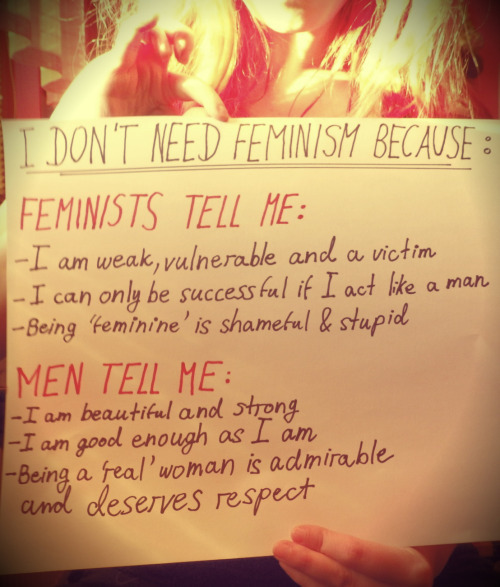 #womenagainstfeminism was a direct response to whoneedsfeminism. Technology undermines censorship. Technology undermines statism. Technology makes obsolete university codes which throttle free speech and a free exchange of ideas. The more that technology progresses, the less that social engineers can control others through threats and coercion. People are then forced to contend in a civil manner to change hearts and minds, through rational discourse. Technology breads civility. This entry was posted in Human Nature, Leftists, Women. Bookmark the permalink.